Every Chinese New Year, the city welcomes thousands of visitors, and for good reason, Hong Kong is one of the liveliest places to celebrate the most important festival in the Asian Calendar. It's a 15-day period packed with bustling fairs, a dashing parade, frisky lions and dragons, extravagant meals, horse races, and of course, fireworks. So where are some good spots to stay? Want to stumble into the revelry of the New Year's Day Parade? Watch the Fireworks in perfect comfort from your hotel room? Enjoy a fabulous New Year's banquet? 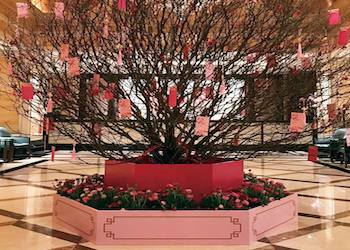 Here are our top hotel picks for Chinese New Year. It goes without saying that most top hotels will book way in advance (many a year in advance), so the earlier you start your search the better! The two main events of the Chinese New Year celebrations are the New Year's Day Parade and the Fireworks display on the 2nd day of the New Year. 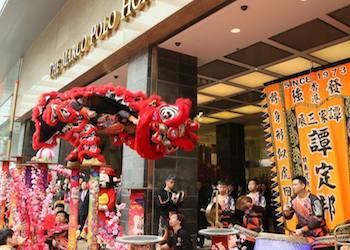 Check out our CNY Page for all events and dates for this year's celebrations. The Parade takes place in the streets of Tsim Sha Tsui whereas the fireworks can be viewed equally from both sides of the harbour. Most if not all hotels will be serving special holiday menus during the festivities. The Parade route goes along Canton Road, Haiphong Road and Nathan Road. On the Island side, check our Top Hotels With Fireworks Views. Great picks for Chinese New Year will also have plenty lots of dining choices and celebratory offerings and excellent and convenient transportation options so you are also within easy reach of the Parade. 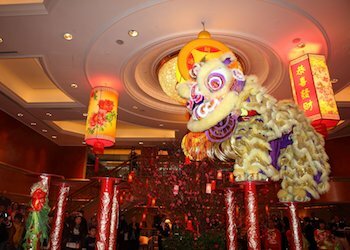 If you will be visiting the Chinese New Year Flower Market in Victoria Park in the days preceding New Year's Day, the The Harbour Grand and The Park Lane Hong Kong are top choices. The hotel offers superb views of the world's most dramatic waterfront and is one of our top picks for the legendary fireworks. It is also right on the route of the New Year's Parade and steps from the Lantern Carnival at the HK Cultural Centre Piazza. This hotel is in the middle of everything with plenty of transportation options to get around, steps from the Star Ferry and the MTR. At the Marco Polo you can savour exciting flavours at three restaurants and bars renowned throughout the city as amongst Hong Kong's best: Cucina, Cafe Marco and Lobby Lounge, in addition to the myriad of options at Harbour City. There are actually two other Marco Polo brand hotels in Harbour City in addition to the Marco Polo Hongkong Hotel, there is also the Gateway and Prince Hotels, both 4-star hotels also offering a stupendous location steps from the parade and exceptional value. Located in the heart of Tsim Sha Tsui this hotel is perfectly situated for taking in the excitement of the festivities in grand style. Service at the Peninsula is over the top, and come holiday time, it won't dissapoint. 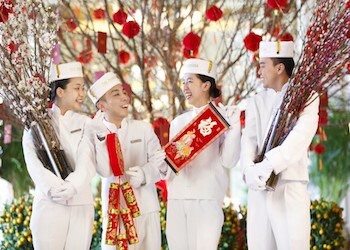 Its location on the route of the Chinese New Year Parade, the commanding views of the harbour for fireworks viewing and plenty of traditional Chinese New Year menus featuring dishes with prosperous associations at their award-winning restaurants will make for the perfect stay during Chinese New Year. Chinese New Year Lucky Set Menus are available from January 20 to February 19, 2019 at Spring Moon, the hotel's Michelin starred Cantonese restaurant and start at HK14,688 for a table of 10. More info and Menus here. A la carte Chinese New Year menus loaded with auspicious fare are available from February 5 - 19, 2019. Click here for a la carte menu. InterContinental Hong Kong, with its dramatic Kowloon waterfront location, always provides a spectacular setting for the holidays. Enjoy the breathtaking panoramic views of Hong Kong Island with its kaleidoscope of lights and the New Year's Fireworks, as the dramatic backdrop for holiday dining in the five stylish restaurants and stunning Lobby Lounge. The Chinese New Year Parade is just steps from the hotel, you can walk along the waterfront and catch it right at the start by the HK Cultural Centre or at the end by Nathan Road. 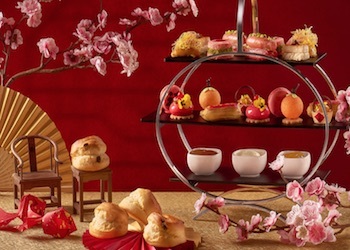 The Intercontinental is serving a celebratory Chinese New Year Afternoon Tea during the holiday period featuring a selection of savoury and sweet items inspired by traditional Chinese seasonal ingredients. January 2 - February 28, 2019 - HK$688 for two. More Info. Occupying a prime spot along Kowloon's Golden Mile and Victoria Harbor, at this 5-star Sheraton you will be able to watch the Chinese New Year parade which will end the route just in front of the hotel, enjoy the fireworks from any of the Harbourview restaurants or the fantastic outdoor pool with stunning city views. 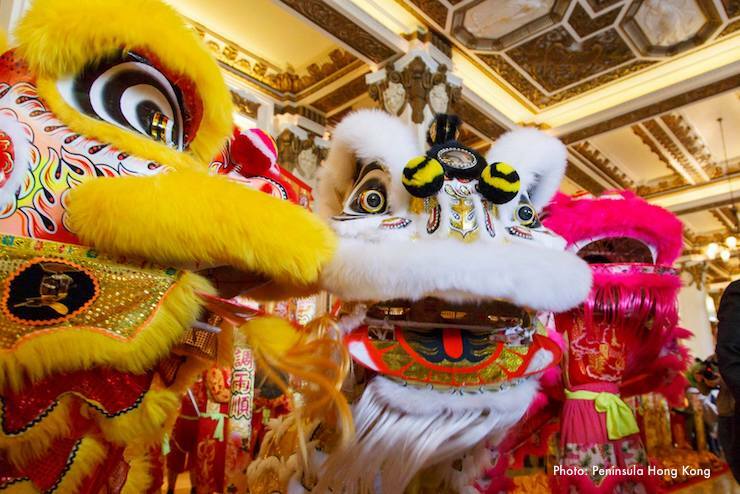 During the holiday period it is not unusual for the hotel to treat guests with Lion Dance performances that will be sure to usher in good fortune and prosperity. Exquisite festive feasts will be offered at the hotel's award-winning Chinese Restaurant, Celestial Court, serving seasonal menus offering a selection of crunchy vegetables, savory meats and succulent seafood, as well as a wide selection of teas. The Holiday Inn Golden Mile is an older property in the heart of Kowloon's lively Tsim Sha Tsui district. This is one of the first hotels we ever stayed in Hong Kong eons ago and is still going strong. What we loved more than anything was the location, adjacent to the MTR makes it a breeze to get around anywhere in Hong Kong. It's a Holiday Inn so you know what to expect, rooms are spacious and if you are traveling with family, book a deluxe room which can accomodate a family of 4 in two double beds. A perfect base for staying over Chinese New Year, the harbour is only a 5-minute walk away for fireworks viewing or the Lantern Carnival, the hotel sits right on the parade route, and there are plenty of dining options around including the hotel's own award-winning Cantonese restaurant, Loong Yuen, which will be going all out with an array of delicately hand-crafted dim sum and traditional favourites during the holiday period. Auspicious Chinese New Year Delicacies at Loong Yuen from January 1 - February 28, 2019 - Come with the whole family and experience traditional but delicate Chinese New Year dim sums created with precious festive ingredients such as abalone, sea moss, XO sauce and so much more! - daily from 11:00 am to 3:00 pm. See menu and make reservations. The Langham Hong Kong is renowned for its trademark European elegance and style, superb dining and flawless personalised service. It enjoys a fantastic location in the middle of bustling Tsim Sha Tsui, 5 minutes from the MTR, AND right on the Chinese New Year parade route. Although The Langham has no direct view of the fireworks, it is only a short walk to Ocean Terminal Rooftop Car Park of Harbour City which is open to the public for fireworks viewing. 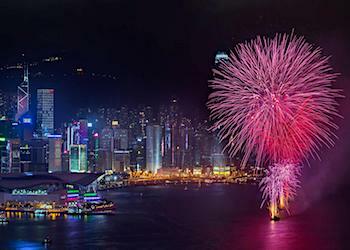 See where to watch the fireworks Kowloon side. There are five restaurants onsite including 3-Michelin-starred T'ang Court, this is only one of five Cantonese restaurants in the world to receive this honor and as you can expect, come Chinese New Year time, you will be in good hands. Starry Chinese New Year Menu at T'ang Court from February 5 - 11, 2019 - T'ang Court specially presents a festive menu to usher in a fruitful year. Dine on a range of conventional festive dishes, including Sautéed Prawns and Scallops with Celery, Red and Yellow Bell Pepper in Taro Nest and Braised Dried Abalone with Fish Maw and Beche-de-Mer. T'ang Court Tasting Menu - HK1,180 per person, optional HK$580 wine pairing. A la carte menu also available. See menu and make reservations. The Harbour Grand is one of our top hotels for fireworks viewing. Its location in North Point in Hong Kong Island boasts a 270-degree view of the Victoria Harbour skyline. In addition, the hotel is only 5 minutes walk from Fortress Hill MTR station, easily connecting you to any point in Hong Kong. Skyline Pavilion at the hotel's rooftop is the best vantage point to to embrace the magnificent harbourview and Fireworks display and is exclusively open for all in-house registered guests and diners to enjoy the spectacular fireworks show to welcome the new year. The main Chinese New Year Flower Market during the days preceding New Year's Day takes place at Victoria Park, you can walk from the Harbour Grand in about 20 minutes or so. The opening of Skyline Pavilion is subject to weather condition. More info, menus and reservations. Located in Causeway Bay, this hotel offers breathtaking views of the city landscape, Victoria Park and the Harbour. 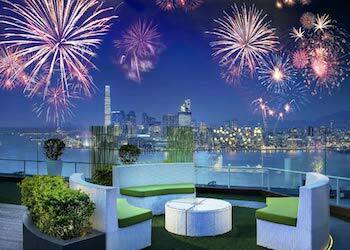 The roof-top bar has incredible views and is a fantastic venue to enjoy the fireworks. The Park Lane is also located just accross the street from Victoria Park, where the main Chinese New Year Flower Market takes place in the days preceding new Year's Day. 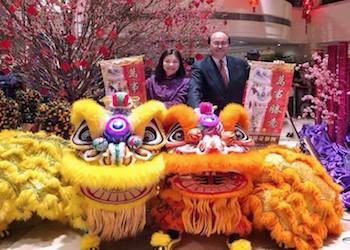 The Park Lane is offering a Chinese New Year Fireworks Banquet Dinner for groups at their fantastic harbourfront venue on the 28th Floor, includes three hours unlimited pouring of soft drinks, orange juice and house beer - HK$9,388 for a table of 12. See menu and book here.